According to recent reports in The Gainesville Sun, there is a chickenpox outbreak in Florida that has recently spread to five different schools. Currently, the outbreak involves 65 cases in which 26 children were infected from the Bhaktivedanta Academy, 25 children from the Alachua Learning Center, one child in a public school and 13 others — four adults, eight children and one infant. Unfortunately, Bev explains that Josh contracted chicken pox right around the time that the vaccine was first introduced. Unfortunately, even 15 years after the vaccine has been introduced, there are parents who still refuse this particular vaccine. Not only are they refusing the vaccine, but there is evidence that some are actively seeking a varicella infection through various parenting forums and social media outlets like the “Find a Pox Party in Your Area” Facebook page. People have even been known to mail chicken pox lollipops and other contaminated items to help spread the varicella infection to children in various areas of the country. Obviously, these actions come from parents that believe it is better to infect their child “naturally” with the live varicella virus than have them attain immunity through the use of a safe and controlled vaccine. But one must wonder if they have ever stopped to consider that mailing these items are not only illegal, but potentially dangerous as they can be exposing their children to a whole host of other infections. However, as I read reports regarding the current cases in Florida, there are a few other points that I would like to offer for discussion. First, the article noted that 26 of the Bhaktivedanta Academy’s 27 students were unvaccinated and the health department determined that the outbreak demonstrated that the virus had an attack rate of 96.3 percent. These numbers help illustrate how pockets of unvaccinated children can pose an elevated risk for the spread of disease. It’s important to consider that sometimes, these numbers are not immediately evident when looking at the overall immunization rates of an entire state. Rather, they appear in isolated areas, as seen in these two schools. While there is no way to be sure, this seems to suggest that there was no medical, philosophical or even religious reason why these students were not vaccinated prior to now. In fact, one school representative stated that not vaccinating didn’t have anything to do with the school’s affiliated religion and stated that “It’s just a matter of parental preference”. It’s clear that as soon as these parents realized that their students were to be restricted from school, they quickly arranged for vaccinations. Perhaps it was just more convenient for the parents to get them vaccinated now, when they were faced with specific and direct consequences, as opposed to vaccinating them at the time of enrollment – illustrating that some parents remained misinformed about the importance of immunizations and some may not be vaccinating as a matter of convenience, rather than of personal conviction. The reality is that not every story of chicken pox will end like Josh’s – but certainly some will. So why do parents prefer to take unnecessary risks when a vaccine is available? Even if the virus didn’t result in death, why wouldn’t a parent want to prevent their child from suffering an extended period of discomfort, that may result in permanent disabilities like Adam’s experience below? For those who have witnessed the horrible consequences of this disease, like Josh’s family and friends, this is one vaccine that we can be fortunate we have to offer children today. If parents are vaccinating for other illnesses, hopefully they will see that their children also deserve protection from varicella as well. And as for parents intentionally infecting their children, we can only hope that these children will survive to make a better decision for their own kids. huh…Propaganda? this must have been written by a pharmeceutical rep, good luck in life if you still read this crap on wordpress. This is just IGNORANCE and fear mongering. I’ve been wanting to say this to some one all day, so I’ll say it to you Christine Vara…..STFU. You want to give BOTH sides to EVERY story if you have any intentions of becoming a REAL reporter. Go read a vaccine insert. My son was irreversably damaged by the very thing that I was told would keep him SAFE. I was tired and b*tchy before, lack of sleep from my son’s vaccine damage and life threatening reaction to antibiotics, now I’m disgusted…WITH YOU. @Trudy & Amy – really? I had Chicken Pox as a kid & it was anything but benign….my siblings and I spent a pretty horrendous few weeks in adject misery. And Trudy – when did you file your claim with the Vaccine Court? Put up or Shut up. Oh the chickenpox! Whatever will we do!?!?!?!? Quick–quarantine the incubators!!!! @Victoria – please explain to Josh’s family how “benign” Chicken Pox can be……. Lawrence, I already did put in for VICP but our case went through Kangaroo Court and we voluntarily withdrew. What other product on the market enjoys complete “immunity” from lawsuit besides vaccines? My son has a medical chart 4 inches thick but because he is ALSO diagnosed with autism to go with the medical mysteries he wasn’t born with….and we all know that vaccines don’t cause autism. My son’s list of medical issues were null and void because of ONE word…autism. Yeah, that’s the way it works. As long as you don’t mention your child’s autism you get handed money for the brain damage and medical issues that are life long. Great. I did put up so now you can shut up. My son spends every day in misery from BLEEDING ECZEMA, very similar to having CHICKEN POX every day of his life but I guess that doesn’t count in your book? You lived right? You’re not covered in any rashes today are you? My son has had this for years. Wasn’t BORN with it. VACCINE DO HARM SOME PEOPLE. PERIOD. THAT you can NOT deny so don’t waste YOUR time arguing with me about the fact that my son was one of those people. You’ll be the second person I tell the STFU today…d*mn, I feel some much better now. What other product on the market enjoys complete “immunity” from lawsuit besides vaccines? Vaccines do not enjoy such “immunity.” Perhaps that is why you put the word “immunity” in quotes. Maybe you meant something else. Like “rigorous preclinical testing and postmarketing surveillance.” Because indeed, few if any products are as stringently monitored for safety than vaccines. My son has a medical chart 4 inches thick but because he is ALSO diagnosed with autism to go with the medical mysteries he wasn’t born with….and we all know that vaccines don’t cause autism. My son’s list of medical issues were null and void because of ONE word…autism. Yeah, that’s the way it works. I find this claim extremely doubtful. Antivaxers are well aware of the recent PACE law review showing that there have been cases of children with autism or autistic-like behavior who were compensated because they had another condition that was compensatable as a vaccine injury. Clearly the word autism does not invalidate you from receiving compensation. It is certainly unlikely that you would receive compensation for autism – the Autism Omnibus demonstrated decisively that the evidence thus far refutes a causative link. But if you had a case of actual vaccine injury, concomitant autism would not preclude you from succeeding in Vaccine Court. My suspicion is that the idea of vaccine injury, however, is yours and would not hold up to an examination of evidence. My son spends every day in misery from BLEEDING ECZEMA, very similar to having CHICKEN POX every day of his life but I guess that doesn’t count in your book? It certainly counts – it’s horrible for a child to have that. But the evidence does not indicate that bleeding eczema is caused by vaccines, so I am not sure why you bring it up. Almost no one is “born with” eczema; this does not mean they got it from a vaccine. VACCINE DO HARM SOME PEOPLE. PERIOD. THAT you can NOT deny so don’t waste YOUR time arguing with me about the fact that my son was one of those people. Your logic doesn’t follow. The fact that some forms of vaccine injury exist, rarely, does not mean that autism or bleeding eczema are vaccine injuries. P.S. Have you noticed yet, that every time you tell someone to STFU, that empty feeling doesn’t actually go away? @Trudy – glad spreading lies and misinformation makes you feel better.It must be some comfort that you can lay the blame on something, too bad it had to be vaccines – too many children ages ago never made it to adulthood, because of diseases that vaccines now control or have almost eliminated. There are well-documented side-effects from vaccines, they do occur and very rarely, they are fairly major. Unfortunately for you & others, autism is not one of them – you would think, if vaccine manufacturers had the influence you say they have, that no side-effects all at would be mentioned. You also realize that autism isn’t a single “disease” or syndrome, right? It is actually a whole host of diagnostic criteria – so to say that “autism” is all vaccine related doesn’t even make sense in like of the multitude of studies that show no correlation between vaccines and the development of autism – when we find genetic markers, age of the parents & other “environmental” likely candidates with, you know, actual evidence to show the relationship. So, I think you should just shut it – diseases actually kill people. Oh good for you Lawrence. You sure put me in my place, didn’t you honey?? I’m so proud of you. You are now done wasting your precious time on a mother that has a clinically diagnosed vaccine injured child. Yep, those stoopid doctors at the Cleveland Clinic don’t know their asses from a hole in the ground do they? That my son’s liver disease is directly tied to the Hep B vaccine? They sure don’t know what they’re talking about do they? Yadda yadda yadda, you need better material Lawrence. When was the last time you posted on Huff Po? I love how the vaccine injury changes when the first claim doesn’t work. First he has autism and when that doesn’t buy any sympathy now he has liver disease. Nevermind that the HepB vaccine is a subunit vaccine. It actually doesn’t replicate in the liver like the real virus does. You can’t even support your claim in “kangaroo court”, Tanya, why would you expect us to believe you after you admitted that? That is the lowest standard of evidence and you can’t even met that bar despite a 4″ folder of “medical evidence”? Yup, not terribly convincing compared to a case of a child that actually died and another permanently harmed by a vaccine preventable disease. “meet” and my name is not Tanya. Ummmm, the VACCINE caused my son’s liver disease which would make him VACCINE INJURED. Keep up with the program “Kelly”. My claim did not change, I added the diagnoses of the actual vaccine injury. Except you didn’t properly research your lie, Trudy. The HepB vaccine is subunit vaccine. It doesn’t replicate in the liver like the real virus does. There is no way the vaccine damaged your son’s liver. You made it up. Can I have your medical degree license number? Why would you need that information Trudy? If I’m wrong, please, explain to us how the hepB vaccine caused your son’s liver damage. Remember that you have already admitted you couldn’t even come up with a plausible explanation for vaccine court and withdrew your claim. If you failed there, why do you think you’ll suddenly have credibility here? @Trudy – wouldn’t be caught dead at that wretched hive of scum and wackery. If you had a true “clinically proven” vaccine injured child, then you are entitled to compensation through the Vaccine Court & compensation program. There are legitimate vaccine injuries – they are well documentated and information related to them is put in front of parents every single time they bring their child in for a vaccination. Thank you for telling me what really happened to my child. I’ve been praying to you for years and I’m so thankful that I finally got a response. So now you admit you don’t know what is wrong with your child? I thought he was “vaccine-injured”? Good to know that even you don’t believe your own lies, Trudy. You claim that your child is “vaccine-injured” but then admit that you couldn’t support that claim in court and voluntarily withdrew your claim, and further admit that you really don’t know what is wrong with him. So I’m curious, why are you hear lying and swearing at people? Are you the one that is projecting your ignorance and fear-mongering onto Christine? Because her blog post isn’t ignorant nor fear-mongering but here you are spreading lies. Thank you so much for getting my name correct this time! Thumbs up! No problem. I forgot to thank you for correcting my grammar the last time. Appreciate that. You’re so welcome Kim…er, I mean Kelly. I am sorry for Josh, but truly for the chicken pox 0he is the exception- the one in a million. Almost always it’s nothing more than a few days in bed . Then the kids are free from chicken pox their whole lives. So much better than to have to keep having boosters. The US is vaccinate until the cows come home crazy. Never mentioned are the damaging side effects one can have from the vaccine itself. Need to be honest and up front. Sure hope someone put the child in jail(NOT) who started the whole thing. Secondary bacterial infections (5%-10% of cases), low platelets (1%-2%), hospitalization (2-3 per 1,000 cases), cerebellar ataxia (1:4,000), encephalitis (1:5,000), invasive group A Streptococcal infection (5:100,000), shingles during childhood (68:100,000 person-years), congenital varicella (up to 2% of fetuses born to mothers infected at 13-20 wks’ gestation). Case fatality highest among adults (30 deaths/100,000 cases), then infants < 1 year of age (7 deaths/100,000 cases), and then those 1 to 19 years (1-1.5 deaths/100,000 cases). Local pain, swelling and mild fever in 10%-20% and varicella-like rash in 1%-5% of vaccinees. Shingles post-vaccine (2.6 per 100,000 doses). Serious adverse events are rare following immunization. No deaths or congenital varicella attributed to vaccination. So please explain how the disease is less risky than the vaccine, maurine, because the data says you are mistaken. Its very clear that neither of you have seen the CURRENT recomended vaccination chart that the CDC published publicly. Its also very clear that neither of you has a child with Autism. Most likely you have not experience the heartache of having a well baby hitting every milestone up until the vaccine and then go through the worry of a high fever and later a regression of your once healthy well baby to a lonely no speech no interaction child. Why dont you educate your self before you start posting nonsense. And it seems that I am way more educated than you. I know that vaccines don’t cause autism and you don’t, for example. I also know that autistic children are just as deserving of their parents love and affection as neurotypical children. I’m so sad that you see autistic children as damaged. So why don’t you follow your own advice and educate yourself before posting nonsense, Marcela? You are 100% vaccines do not cause Autism? Really? You have a autistic children. You have gone through the ache and pain or are you just reading the information that the media the doctors that also have been all their educational live reading what pharmaceutical companies need them to read. Unless you have a child with Autism you should not be speaking on the matter. Right. So if I have a child with autism, I’m magically transformed into this all-knowing super human? What was that about nonsense, Marcela? I’m I 100%? No, of course not. That would be a logical fallacy. The current research does not support your claim, but if something new comes along, I’m able to evaluate this new evidence. So what do you have that supports your claim besides “mommy knows best”? And what happens if I am a mother of an autistic child and I think vaccines don’t cause autism? Does my mommy power trump your mommy power? What about dad’s of autistic children? Do they have this omnipotence or does it just apply to moms? You don’t have to have a child with autism to be able to speak with authority about autism. Many experts on autism do not even have children. Aside from that, because you have a child with autism does not indicate that you are, in any way, an expert in autism. You may understand better the day-to-day difficultly of raising your child, but experience in symptoms and behavior does not equal an understanding on origin, development, or any other clinical or scientific detail of the disorder. I, for one, agree with Kelly. I hope you people will go and hug your children and stop treating them like they are scourges of your lives (maybe not to them directly, but to declare them as damaged goods to the entire world). I understand that it is difficult, but I hope you can muster the strength to take the injustice of your situation and apply it to raising and loving your kids. Stop seeking scapegoats and go live. Thanks for this further admission of your dishonest nature, Trudy. I’ll take it that Jackie and Marcela are the ones you have so far? I’m sorry, my name is spelled K-E-L-L-Y. I thought someone that would correct a person on the proper spelling of her name would be mindful of not misspelling Kelly as Amanda. Tanya/Trudy, at least I was close. How you get Amanda out of Kelly is just beyond me. I was referring to your other name you’ve been posting under Amanda/Kelly. Have a nice evening, I’ve wasted enough time here. You certainly made yourself look like a shining star this evening. Except I’m not posting under another name. That’s just something you made up, just like you made up that your son is vaccine injured. AND I’ve posted my full name. I have nothing to hide. I stand behind everything I have said. Now, commence the ignorant comments because you know you can not resist. My son is vaccine injured, has bleeding eczema and liver damage caused by vaccinations. He is the reason I breath and I will never stop telling people the horrors of what he and I went through because I assumed that this could not happen to my child. That the “benefits” outweighed the risk I was taking with my son’s life. I was told I was doing the right thing and when my son was damaged, I’m told I’m lying, that I’m spreading misinformation, and that I’m “foul mouthed” because I said STFU (they’re just letters) and I said *I* was bitchy. I have no doubt that having a sick child is very hard for you. My problem is your claim that your child is vaccine-injured. That is a lie. His conditions are not caused by the vaccine. You just want to believe that they are. By spreading this lie your are scaring other parents into thinking this is a risk to vaccination, when it is not. The consequence of this is that these parents may believe you and choose not to vaccinate based on the lies you told and then their child suffer real harm. That would be a real tradegy. I believe parents should make an informed choice and part of the informing is warning others that you are lying. The benefits still outweigh the risk because his illness is not a risk. I don’t use my full name because anti-vaxers are foul-mouthed, dishonest people that like to see others harmed. You don’t take too kindly to me correcting your lies and I’ve been threatened by folks like you in the past. However, you don’t need my full name to verify anything I’ve said. I’m not making an argument based on authority. The science supports that the benefits of the vaccines outweigh the risks. All you have got is your name, which really doesn’t mean anything because you said you plan on making up other names to astro turf the blog. I never expected chicken pox to bring out the ick and eww in people as I have seen thus far for this posting. I was like a lot of people and assumed chicken pox was benign. That was until my first child caught it when she was in kindergarten (her two younger brothers did not get it at the time though.) She only had a few minor spots as far as her rash went, but she ran a fever over 104 for nearly two weeks that the standard fever reducers wouldn’t bring down. She couldn’t eat anything, she had to be carried to the bathroom and could only handle sponge baths. This was before there was a chicken pox vaccine. When my second child was in kindergarten, he caught it and spread it to his two younger brothers, one was 3 and the other was 9 months old. My 9 month old had a rash so bad it looked like he had leprosy. It covered huge patches of his body and I did everything in my power to keep him comfortable, even though I could tell he was not. He cried all the time where normally he was the mellowest, most easy going baby I’ve ever had and always had a ready smile. My son who was 3 at the time got pox in his ears which became infected and closed off his ear canal and there was some worry by his doctors it might become gangrenous if we couldn’t get the infection under control. When my younger daughter was finally born, the vaccine was available and she got it and never suffered from chicken pox, thank goodness because I found the whole incident with my previous children traumatic having to watch their suffering and know there was little to nothing I could do to ease it. My youngest son also was vaccinated against chicken pox. On a side note, my youngest son also has autism. As I’ve stated in comments to other posts here and other blogs elsewhere, my son was not vaccinated prior to the onset of his autism symptoms, which when reviewed in retrospect, have been there since birth. None of my children has vaccine damage, and while I am aware there are rare cases of it happening, it’s my opinion, the majority of those parents that claim vaccine damage don’t know what vaccine damage really is. If it doesn’t specifically fall into the list of side effects for the vaccine, it isn’t vaccine damage, it’s something else. Vaccines are an easy target because so many other people have been flinging mud at them for decades so they make an easy scape goat. There is a big difference between belief and truth. There are also a lot of things that people believe that are not true, but that doesn’t stop them from believing it, it just makes them all the more adamant that they are right. I’m not sure why it’s so hard for someone to admit they were wrong and embrace truth and seek to educate themselves to their new found truth. Why do they feel so compelled to continue to fight a battle that was lost and over years ago? Rather then focusing on who is to blame (is it at all possible it was just a random occurrence that can’t be explained away at this time?) focus on improving the life of your loved one to the best of your ability. Yes, my son has autism, but hearing that diagnosis didn’t change anything about him, it gave me a path I could see to follow, it changed my role as parent but it doesn’t give me the right to attack people on the internet for disagreeing with me. I feel as though I am rambling now and that I haven’t successfully managed to get my point across at all. Everyone goes through the stages of grief when learning their child has autism (or any other disability for that matter). Anger is one of those stages. Denial is another one. Eventually, in order to be able to help our children, we have to move beyond all those things into the stage of acceptance, and only from there will improvement and progress be found. We can’t help our children if we are focused on being angry. In short, diseases are dangerous and deadly, in the mildest sense they are extremely uncomfortable to go through. Vaccines are extremely effective at preventing uncomfortable, dangerous and deadly diseases and are by far safer then the disease for the vast majority of people. If vaccines are a danger to a person, the wild strain disease will most likely be even more dangerous to them so unless they are immunocompromised, vaccines would still be safer for them then getting the disease. Personally, I prefer my children not to be sick and have to suffer, so they are all vaccinated. Three of my children are adults now so it’s up to them to continue that, but I gave them the best start I could and that included vaccines. Well, let me be the first to say “You’re welcome Lara” for my son’s sacrifice to the herd. I’m assuming that was a thank you…I mean you couldn’t possibly be writing off my son’s vaccine injury as “just something that happens” because Gee willigers, vaccines save lives and it’s unforunate that some much fall in the process. Except it wasn’t your child. It was mine and apparently my child matters not one bit to the Lawrences’, the Kelly’s and the Lara’s of the world. It was just a horrible accident in the name of the greater good. It’s wonderful to know that my son counts to you people in such a way. He is the reason I breath so I will defend what happened to my child, what he was diagnosed with and what I witnessed happened to my beautiful healthy child. He’s still GORGEOUS but he isn’t so healthy any more but that’s no concern to any of you. @Trudy – screw you! You put the blame on something that is unproven, yet I can go back just one generation in my family and go to the grave markers of two of my uncles that died of vaccine preventable diseases before they reached the age of 5. Or better yet, I can visit my aunt in the care facility she has resided in since the day she was born, due to disabilities from rubella caught in the womb – she is in fact autistic, quite profoundly so – which is a very real side effect of the disease. and Lawrence, you can go visit my son in an institution once I’m dead and gone and can no longer care for him. Screw me? Nice. More proof positive about scare tactics. You come across as caring and insightful and compassionate for my child’s plight. It’s about YOU and your relatives and the rest of the herd, not about the individual. I got it now. Trudy, we established that you are lying about your son’s “vaccine-injury”. He isn’t vaccine injured. You made that up. Of course your child matters and I’m sorry that he is sick, but I don’t see how misleading people into not vaccinating is going to fix your son. All you are doing is misleading people so that more children can suffer. Why do you want to do that? If your life is so horrible with a sick child, why would want others to join you there by encouraging other parents to leave their children vulnerable to becoming sick? *an abomination. It’s a CRIME against humanity itself. MY CHILD COUNTS. MY CHILD COUNTS MY CHILD COUNTS. Yes, your child counts. Why don’t you go spend some time with him instead of lying to people on the internet? and having one child suffer because they read your lies is worse. Your son would be the same whether he was vaccinated or not, but you would like to scare others into purposefully leaving their children vulnerable to harm and suffering. Your child is not vaccine-injured. You admitted you don’t know what is wrong with your son and you could not even meet the low bar of vaccine court. You want to believe his vaccine-injured. Well, to ask other children to suffer because of your beliefs is wrong Trudy. What the hell is wrong with you? Just because you hate your son doesn’t give you the right to wish harm on other people’s children. Of course, because I’m not supposed to ever be on the internet. That would make me a horrible parent to spend a couple of hours on the internet. I’m a refrigerator mother because I got on the internet….god forbid, I am on the internet. Why are you on the internet Kelly? Don’t you have children to attend too? I’m on the internet correcting your lies and fear-mongering, Trudy. My children do not need my attention right now. @Trudy – parenting is hard, harder with children that have suffered developmental disabilities. Blaming vaccines, against all available evidence, is not helping – and through your actions & others, it only means that more children will be inflicted with real diseases, suffer real side-effects, and be placed in the same boat. My two boys are fully vaccinated – as individuals, and as their parent, I don’t want to take the chance that they will contract easily preventable, but potentially devastating diseases. And the facts back me up, not you. My comments stand and you can bash me all you want. It makes you look like an uncaring, ignorant fool. Well done. Did you not realize that this is where I was leading you? That I wanted you to show your asses? You fall for it everytime. Thank you. @Trudy – Well, one of us comes off as close-minded & ignorant. Pretty obvious who that is here…..
You are the one trying to mislead other parents so that their children are left vulnerable to harm and suffering by telling lies, Trudy and you think I’m the uncaring, ignorant fool? Right. It’s pretty clear that you are a foul mouth (you started her with stelling people to STFU) liar that not only despises her own son but also wishes harm on others, Trudy. I’m here so that parents can make the best decision for their children and not fall for your fear-mongering lies. Nice try though. Also, thanks for admitting that you are just here to troll the page. You aren’t here to add insight or knowledge but just to post inflammatory comments to see if you can get a rise out of us. That admission does help us a lot in establishing that you are not someone worth listening too. We are all very well aware of the potential, real, side effects of vaccination. We are also very aware that the side effects of the actual diseases themselves are both much worse and occur much more often than anything one would receive from a vaccine. These so and sos have raked me over the coals because my daughter reacted to the hep-B vaccine with encephalitis and was later diagnosed with autism. I contacted a lawyer, who said while he believed from so many parents’ stories that it was true, that no lawfirm in the land would take a case alleging vaccines had caused autism, not because it wasn’t true, but because it’s politically an issue that is stacked in favor of the vaccine companies. These ### will accuse you of lying and not pay attention to a single thing you say. Most sites won’t permit comments that stoop to personal insults: not this one! These jerks told the mother of a vaccine-damaged autistic child the other day that she was deliberately lying, did not love her child, was not really his mother, but had only given birth to him, but had not acted like a mother to him, and her being unhappy about his vaccine-induced autism was shameful. Take a look at the satire I wrote this morning and put at the bottom of this site’s propaganda piece on the Vermont bill that was going to take away the philosophical exemption. Mothering had an article on chickenpox which found that many of the children who had “died” from the chickenpox really died from all the drugs they were given at the hospital which killed them. The chickenpox vaccine has an extremely high rate of causing severe reactions, even death, and the natural disease is nearly always as mild as it was when I had it as a child and my daughter had it ten years ago. One day of fever and two or three weeks of itchy bumps. Then permanent immunity. Hey cia’s back to lie some more. I thought it was beneath you to interact with us cia? See the similarities between Trudy and cia? Both claim they have children with vaccine injuries. Both were unable to meet the lowest bar on vaccine court. Both cannot support their claims with science. Both continue to lie about “vaccine-injuries” even after being caught in their lies. Most sites won’t permit comments that stoop to personal insults: not this one! I know, cia. This site let’s everyone post, even you, who is a known liar and name-caller. So now we are jerks? I’m still laughing at your “satire” cia. That was a great piece of fiction. I wouldn’t direct others to it though because it really does weaken your credibility. The chickenpox vaccine has an extremely high rate of causing severe reactions, even death, and the natural disease is nearly always as mild as it was when I had it as a child and my daughter had it ten years ago. One day of fever and two or three weeks of itchy bumps. Then permanent immunity. citation need, cia, especially since I have already posted evidence that this is a lie. You are clearly confused. There are no deaths associated with the vaccine. The deaths are associated with the disease, like Josh in this post. There is also no permanent immunity to the virus. The virus comes back as shingles. I know exactly who they are. They run around from article to article, site to site and spit, curse, call names, regurgitate the same tired lines that I’ve been seeing for almost 10 yrs. All I know is what I speak is MY truth, my doctors truth and most importantly MY SON’S truth. It’s ok, they can keep going because tomorrow, my son will STILL be vaccine injured and what they write on a word press article means nothing to HIM. That would be cia. She tells her lies everywhere and everywhere she is shown to be a liar. It really is rather sad. Your truth is lies, Trudy. That’s sad too. Your son isn’t vaccine injured. You admitted it yourself that you don’t know what is wrong with him and you couldn’t even establish he was vaccine-injured in vaccine court where you don’t even have to show causation only suggest plausibility. Vaccine-injury isn’t even a plausibility for your son. It’s just a fantasy that you believe. And you are right. Claiming that your son is vaccine-injured on a blog does not make him vaccine-injured. He still is who he is. Why don’t you go love him for who he is instead of telling people something he is not. @Trudy – I distinctly remember (and can quote above if you’d like) you telling me to STFU* – so you are being disengenuous at best, hypocritical at worst. Cia never has published science to back up here claims, whereas we can point to the actual incidence of side effects of vaccines vs. side effects for the diseases. In every case, the incidence & severity of the side effects are worse with the diseases than the disease – in each and every case. Who said it was the F word? Could have been “freak”. I didn’t swear at you or tell you “screw you”…you did that. Not me. Hmmmm….semantic arguments now? It really doesn’t suite you…..
How do you know what “suits” me Lawrence? You don’t even know me. God, this is boring. There is plenty of science showing that vaccines cause medical issues. Here’s a few (not all) of the studies showing vaccines cause gut disease. 14. Medical Hypotheses August 1998;51:133-144. 18. Journal of Pediatrics March 2001;138:366-372. 20. American Journal of Gastroenterolgy April 2004;598-605. 21. Journal of Clinical Immunology November 2003;23:504-517. 23. Prog. Neuropsychopharmacol Biol. Psychiatry December 30 2006;30:1472-1477. 27. Archivos venezolanos de puericultura y pediatría 2006; Vol 69 (1): 19-25. The topic is about varicella, Jackie. Perhaps you could narrow down the gish gallop to just the articles that are relevant to the current topic? Still proves that vaccines (no matter which vaccine) cause injury and serious medical issues. All vaccines have the potential to cause serious harm to the recipiant. I would but I’m busy taking care of my child who suffered stroke as a toddler. I’m sure you’ll say that wasn’t from vaccines though, right? I was ignorant like y Do some real research and you’ll find plenty pertaining to everything being discussed here. See, that would be a strawman, Trudy. Nobody denies that vaccines have risks. The key is that the risk of the disease is much greater than the risk from the vaccine. To represent the risk of the vaccine without the corresponding risk of not vaccinating is called “fear-mongering”. , then let’s go. I would love to hear how you compare the risks of the vaccines to Josh’s deaths and Adam’s permanent health problems to the risk of a sore arm. Oh, so you are too “busy” taking care of your toddler but you find time to create a strawman to mislead people. Good to know that you are an intellectually dishonest person, Jackie. What about other people that are busy with their lives. Why should they spend the time reading your list when you aren’t willing to spend that time yourself? Trudy, the inconsistency is that she claims she doesn’t have time to be on the internet but she is on the internet. You never made that claim. Jackie has enough time to mislead people but when she is called out for being dishonest, she suddenly doesn’t have time. You are also confused as you are the one that implied that I was neglecting my children. I just suggested that since you find us countering your lies so frustrating and you claim that your son is so important to you, why not get off the internet and go play with him instead. You can spend as much time on the internet discrediting yourself as much as you want. It certainly makes my job easier when the anti-vaxers continue to lie to people. Oh, your JOB? J.O.B.??? So you admit to getting paid to do this? No. I don’t get paid. I volunteer because it is important to me to see that parents are able to make an informed choice and not be mislead by the lies commonly told by anti-vaxers. Wait a minute, these studies don’t even show that vaccines cause gut disease either! The first one has nothing to do with vaccines, it is about reflux and other GI disorders that may go undiagnosed in autistic children. The second one, I can’t find, but I note that it is the same citation as number 18, except 2001 instead of 2000. Hmmm. And that article is called “Colonic CD8 and γδ T-cell infiltration with epithelial damage in children with autism,” and the word “vaccine” is not used in the entire text. Double Hmmm. And it is co-authored by one Andrew J. Wakefield. That’s a Hmmm TKO. I have the sinking feeling that I could go through this entire list and not find one study showing that “vaccines cause gut disease.” It does not seem like it would be a promising endeavor to try. Behold the Gish Gallop, presenting a huge list of studies that you claim support your position, but actually don’t, hoping that the list is so intimidating that no one will try to prove you wrong. I’m not surprised. The Gish Gallop is a classic anti-vax diversion tactic and is characteristic of their intellectual dishonesty. That Gish Gallop looks familiar: Still no independent confirmation of Wakefield’s claims. I was just wondering if it would be worth the time to see if Jackie copied that list from somewhere. Thanks, Chris! No wonder Jackie didn’t want to discuss her list. She hadn’t actually read any of these papers herself. Thank you, Chris! And I see you deserve kudos for your help with that! Good work! So, wait a second… that list is supposed to be a list of “independent confirmation of Wakefield’s claims,” which is not, but Jackie claims it is a list of studies that show that vaccines cause “gut disease,” which it does not either, as there is precious little mention of any vaccines in the entire list (and some don’t concern gut disease). It is hard to pack more fail in the singular use of a Gish Gallop. I also love the citation of “Journal of Neuroimmunology 2005.” An entire year of a journal. Not that they are obsfucating or anything. Thank you, Jackie, what an intelligent, thoughtfully compiled list! But reason and facts are lost on this crowd, as I’m sure you’ve realized by now. It is a list of papers that pretend Wakefield’s study was independently replicated. They do not (see my link above), and it is just another form of a lie. @Jackie – no one here is claiming vaccines don’t, in a small number of cases, cause side-effects. In fact, it is very easy to find out the incidence – I receive a full list and pamplet from my pediatrician that talks about it at every well-child visit. What vaccines don’t cause – and there is a mountain of evidence to back it up, is autism. If you didn’t follow the Omnibus Hearings – the Special Masters were presented with the best possible evidence that the “autism-link” crowd could come up with, and in the end, the cases were dismissed because the “evidence” didn’t stand up to scrutiny. Science is never completely settled – but a lot of work has been done in the field, and vaccines aren’t the cause of autism (with all of the evidence we currently have). What we are seeing is more environmental & genetic causes of the spectrum of afflictions we know as autism – age of the parents, genetic defects, etc. are all more likely candidates. I don’t believe anyone here ever said anything along the lines of your child not counting, simply that based on your own words, you have confirmed his illnesses and conditions are not vaccine injury as you claim. And it’s funny that you should be so vehement about stating your child counts. When I first received my son’s autism diagnosis, I searched online and reached out to other parents of children with autism, attempting to find some support and solace and maybe ask some questions about what to expect or how to proceed. I wandered onto AoA web site and began reading. There was very little real information about autism resources or assistance, but quite a bit about anti vaccine rallies and demonstrations and such. There was an article regarding Bill Gates and vaccines and autism, I don’t recall precisely what it was about, but I posted a comment about it, expressing my concern that there was such anger about what he had said when science has been unable to find any evidence to support the theory that vaccines cause autism. I explained how I didn’t believe it because my son has autism but was not vaccinated until after his diagnosis, and I know other parents with stories similar to mine. The effect was nearly instantaneous. I was attacked from all angles, called stupid, ignorant, evil, threatened with bodily harm and even death. Many even told me my son couldn’t have ‘real’ autism since he wasn’t vaccine injured and since he wasn’t vaccine injured his autism doesn’t count. In the end, I was banned from posting there, which I’ve come to view as no loss on my part. So perhaps you need to take your anger and venom elsewhere. You started out attacking people when nobody has said anything along the lines of what you are accusing them of. Okay? And what is AoA? So it’s ok for Kelly and Lawrence and even you (in your passive aggressive first post) to attack from all angles, call a mother stupid, ignorant, evil, and accuss that same mother of lying? You don’t like it very much, apparently. I didn’t attack you Trudy. I just correct the mistruths you have been telling. You are the one coming on here telling people to STFU and admitting that your were lying about your son as being vaccine injured. You are the one that describes him as damaged. You are the one that admitted you were trolling the page. I’m not sure why you would expect someone that is as foul-mouth and dishonest as yourself to be treated with respect, especially when your first post in this thread isn’t at all respectful. Was I talking to you Kelly? Oh, wait…maybe I was. Like I said, I need to get some more email addresses so I can come on here and agree with myself. You are REALLY spreading it on thick. You look like a FOOL. Right Amanda?? Or is it Kelly? Perhaps Lora?? NO? Lawrence? Zoey? Hmmmm. If you are anti vaccine and have a child with autism you know what AoA is. My first post was not attacking anyone, just expressing my awe at how much animosity this particular post seems to illicit in people. If you took that as a passive aggressive attack, perhaps you should seek counseling, you may suffer from a personality disorder or persecution complex. It was my intention in my post to share my personal experiences with chicken pox and state my reasons for having my younger two children vaccinated for it since it was available to them. I’ve not seen anyone attack you, but you are doing a fair amount of attacking yourself and it’s slightly disturbing actually that you have so much anger. I fear for you, truly. I’m the one that looks like a fool? You are the one that admits on plans to dishonestly astro turf the blog and expressing paranoid feelings that others have done the same. I speak for no one but myself. May Jesus Christ be with you on judgment day and may the Lord have pity on your soul. Thanks Marcela, same blessing back to you. Absolutely educate before you vaccinate. It is very easy to show that not vaccinating is the inferior choice for most people. The evidence in favour of vaccination is overwhelmingly positive. Absolutely – talk with your pediatrician, read the actual science & not the scaremongering. Vaccines save lives. Look at this great Zew Zealand video, it’s very fair and balanced, shows a girl permanently disabled, both mentally and physically, from the pertussis vaccine, a young man mentally disabled to some degree by it, a little girl with amputated limbs from natural meningitis disease, and a dead girl from HPV vaccine. The New Zealand government recognizes and compensates adverse reactions a lot more easily and often than ours does. You are too kind to the two you mentioned who post “hear”, I trust that they will be judged quite harshly. . I have put on a lot about adverse reactions, cited scientific articles and specific horrible reactions to the varicella vaccine on this site, though not this story. I also admire and respect Dr. Mayer Eisenstein. Do you think anyone intelligent is influenced by this site? Does anyone take it seriously? I hope you’ll answer, I’d like to know your opinion. what kills me, the people who do vaccinate their children, and the ones that dont, are the ones that are bringing back these viruses… there have been alot of studies showing it i thank god i dont live in florida that im in michigan, least here, kids who aint vaccinated do not enter the school system, they have to be home schooled. i wouldnt want my children going to school with kids that aint vaccinated….. i aint putting my kids at risk, when im taking the smart route… I had vaccinations threw out my whole life, and never had problems me and all my children get the flu shots everything.. and its protected us from all of it…. i aint taking the chances of my child dieing from some virus that couldve been prevented in the first place. Oh, my word! Elizabeth are you for real? NO SCHOOL in the 50 United States will deny a child from attending due to vaccination status. If a parent doesn’t vaccinate their child, ALL states have some form of exemption that can be submitted. Please educate yourself as I’m sure there are unvaccinated children that attend school with yours. I ve already spoken to my sons dr and his a great D.A.N dr. Do you even know what that is? Maybe you should look it ip instead of attacking mother s that have lived and are living with vaccine injured children. You and KElly should go get a MMR vaccine and READ the label s see what it contains and the side affects. One month of being in bed with itchy skin has no comparison with a life time of gut and brain damage development issues. Maybe you two should also talk to donald tramp on your so call pharmaceutical studies. Until then keep researching the truth. Yes, DAN doctors are quacks that take advantage of people trying to cure their children’s autism. I have read the package insert Marcela. Not only have I read it, I understand it. I’m not some uneducated person like yourself that missed all the research that shows the MMR does not cause autism. Not to mention gullible enough to be conned by DAN doctors. Who is donald tramp, and why would I want to talk to him? One month of being in bed with itchy skin has no comparison with a life time of gut and brain damage development issues. There is literally no comparison, since the two are not related to each other. It is, in fact, a false comparison. Here is a very good explanation for a DAN doctor, or more appropriately, DAN provider, since many aren’t actually doctors. i know exactly what you mean, i have seen the videos and o myself have witness what these so call good vaccine s do to children. Its horrible. Maybe when we were kids they were safe but not now. How can 30+ vaccine s injectto a baby before age 2 be any good. No way. Look at whats happening around the US. 1 IN 88 ARE NOW DIAGNOSED WITH Autism and no one is researchinh vaccines? Come on wake up American. Its not Genes its not obesity its not refrigerator moms. Pharma knows! Did you watch the video in this blog post about Adam and the medical issues he has because he got chicken pox when he was 7? Those are real injuries. You asked me to look at the CDC schedule, Marcela. I guess you didn’t read it yourself or you would know that there are only 11 vaccines on the schedule, not 30+ and not all of them are injected. It sure does sound more scary when you make up a big number like that, eh? But why tell such a blatant lie? Did you think we wouldn’t look? No one is researching vaccines? Really? Try Pubmed. There are whole journals dedicated to vaccine research. How can 30+ vaccine s injectto a baby before age 2 be any good. 1 IN 88 ARE NOW DIAGNOSED WITH Autism and no one is researchinh vaccines? Come on wake up American. You think no one is researching vaccines and autism? Well, I see the problem. In all your earnest Googling you just haven’t run across the dozens of studies looking at vaccines and autism and finding no link. Well here are some of them. I’m sure it was an honest oversight and that you didn’t simply pass them all off as fraudulent to preserve your worldview. @Nathan – anti-vaccination groups complain about researchers, yet don’t put their money where their mouth is & finance research of their own. Wakefield spent a decade, not researching or putting his ideas to the test (in fact, he refused an opportunity to continue his research at Royal General), instead, he collected speaking fees. A real hero there, let me tell you. They weren’t even safe when we were kids, Marcela, I screamed for a couple of days straight after I got the DPT as an infant, encephalitis, my brother did too, and banged his head on the side of the crib, also encephalitis. That’s what A Shot in the Dark was about, all the damage caused by the pertussis vaccine. Both my arms were paralyzed for two days after a tetanus booster when I was nineteen, brachioplexal neuropathy, and I was later diagnosed with M.S., which I think was set into motion by the autoimmune reaction. My baby screamed constantly for four days and nights reacting to the hep-B vaccine, which I had said I didn’t want her to get. They gave it to her at the hospital the day she was born without even asking permission. She was later diagnosed with autism, and is in a special autism class at a public elementary school. She reacted to the fourth DTaP too, she had started saying two words, but after she got the shot, she never said them or anything else again until she was 34 months old. Heaven knows how much worse she would be now if I had permitted her to get the varicella vaccine or the MMR! But you’re right, this large number of vaccines now on the recommended schedule is criminal, and has permanently damaged millions of children. Starting with one in nine vaccinated children having asthma, one in only fifty or a hundred unvaccinated children get it. I hope Josh’s parents know how much we all appreciate their taking the time to share their story and understand how much it will help other children, especially children of vaccine-hesitant parents who have been mislead by anti-vaccine misinformation and may change their minds after hearing Josh’s story and realizing that vaccines do indeed save lives. Wow… is it really that hard for you to believe that more than one person might disagree with you, Trudy? It’s weird being denied my existence. You are right that we should all feel sorrow and regret at the loss of a child, and I can probably speak for all ot us and say that we do feel regret and sorrow. I hope, though, that you also feel sorrow and regret for the children who have been disabled or killed by the varicella vaccine (as well as all the others). An article in the journal of the American Medical Association September 13, 2000, p. 1271-9, reported that adverse reactions occurred at a rate of 67.5 per 100,000 doses sold. About 4% of these were serious adverse reactions, including numerous cases of neurological disorders, immune system damage, blood disorders, brain inflammation, seizures, and death. Children under 4 years of age had serious reactions at a rate of 6.3% Children under 2 had serious reactions at a rate of 9.2%. Children vaccinated by mistake betwen birth and their first birthday had serious reactions at a rate of 14%. One 4 year old girl developed hemiparesis two weeks after the shot, and investigators concluded that her “apparent cerebrovascular accident assumes particular importance after a recent description of a significant statistical association between natural chickenpox and subsequent ischematic strokes in children.” VAERS reports: 107121 child got varicella shot, developed rash, vomited, screamed, went into cardiac arrest and died four days after shot. 87553 2 year old developed pericarditis, vasculitis, liver damage two weeks after varicella shot. 80082 4 year old developed lymphocytic leukemia, headaches, leg pain, bruises, decreased hemoglobin, platelet counts starting day after his chickenpox vaccine, hospitalized 28 days. 175928 previously healthy 8 year old got dizzy and confused three days after shot, developed seizures and life-flighted to hospital. 275714 8 year old boy vomited and passed out 10 minutes after shot (all of these chickenpox shot), diagnosed with acute respiratory distress and rushed to emergency room. 218460 9 year old girl got Guillain Barré syndrome after shot, five weeks in hospital.114146 9 year old child developed serious blood disorder 13 days after shot, hospitalized. 219497 four days after shot, child unresponsive, focal seizure, started foaming at mouth, hospitalized. Though rarely, either the disease or the vaccine can cause irreparable harm. Every child, every life, is precious. Parents must read a lot before making this decision, but unfortunately, there is no guaranteed safe choice. It boils down to attempting to play the odds. I had chickenpox and measles as a young child, my daughter had chickenpox and whooping cough (though she had been appropriately vaccinated), and gave it to me. My life experience taught me that in our case, as for most people, these diseases were not serious, and I was glad I had refused the varicella shot for my daughter at 18 months. If I had had a sibling die of chickenpox, I’m sure my viewpoint would be different. I would feel terrible if I persuaded someone to forgo a vaccine, and they got a severe case of the disease. However, I would also feel terrible if I persuaded them to get a vaccine, and they suffered a severe adverse reaction to it. I have already givein you the answer here, so you have no excuses for not answering honestly. You are right that we should all feel sorrow and regret at the loss of a child, and I can probably speak for all ot us and say that we do feel regret and sorrow. If you truly feel sorrow and regret at the loss of a child, cia, why are you here purposefully misleading people with the consequence of more children might be lost? I would feel terrible if I persuaded someone to forgo a vaccine, and they got a severe case of the disease. However, I would also feel terrible if I persuaded them to get a vaccine, and they suffered a severe adverse reaction to it. If you would feel terrible, why do you do it? The risks of an unvaccinated person having a severe case of the disease is much, much, much greater than any risk of the vaccine. You are also not being asked to persuade people to get the vaccine. The decision to vaccinate needs to be between the parents and their child’s physcian with proper weighing of risk vs. benefit. You are being asked to stop misleading people with misinformation that has been corrected for you many times. You have yet to correct your information and continue to advocate against vaccines even though: (1) you know you are wrong and (2) you claim you would feel terrible if someone suffered the logical consequences of your advice. ugh, sorry for the blockquote screw-up. The first paragraph is a quote of cia, the second paragraph is my response. Interesting. But repeating the same fallacies does not make them anymore true they were the first time, Cia. …and express that regret by coming and telling the blogger to “STFU?” Yes, the empathy is palpable. I don’t think you speak for all for all antivaxers. I hope, though, that you also feel sorrow and regret for the children who have been disabled or killed by the varicella vaccine (as well as all the others). An article in the journal of the American Medical Association September 13, 2000, p. 1271-9, reported that adverse reactions occurred at a rate of 67.5 per 100,000 doses sold. About 4% of these were serious adverse reactions, including numerous cases of neurological disorders, immune system damage, blood disorders, brain inflammation, seizures, and death. Here is that study. I have the bad feeling that you haven’t actually read it. Let me point out some salient passages. To date, unless you can demonstrate otherwise with actual scientific evidence, no deaths have been shown to be from the varicella vaccine. 100 deaths or more were shown to be from wild varicella disease prior to the vaccine. Listing VAERS reports continues to be your favorite hobby, Cia, but the reality is that a VAERS report does not equal a vaccine reaction. Studies of the varicella vaccine, such as the one that you cited yourself, demonstrate that serious reactions are extremely rare and death is not, as far as the evidence shows, one of them. Parents must read a lot before making this decision, but unfortunately, there is no guaranteed safe choice. There is, however, a clear safer choice. One hundred deaths annually from the disease vs. no deaths annually from the vaccine. cia caught in more lies. Why am I not surprised? In another kind of lie, Ms. Parker uses an older paper instead of citing Safety of Varicella Vaccine after Licensure in the United States: Experience from Reports to the Vaccine Adverse Event Reporting System, 1995–2005, which has updated statistics. One of the more interesting statistic is that the reports of adverse events after vaccination go down each year. “The potential for vaccine-strain VZV to cause death appears to be remote, and the benefits provided by the vaccine far outweigh such concerns. Vaccine-strain VZV was confirmed as a possible contributing factor in only 1 death, that of a child with NK-cell deficiency . Before the varicella vaccination program in the United States, ∼100 children and adults, most of whom were healthy, died each year from varicella . In contrast, since implementation of the varicella vaccination program, deaths due to varicella have declined substantially. By 2001, varicella as an underlying cause of death had declined by 92% among children 1–4 years of age and by ⩾74% among all age groups <50 years ." Thank you Bev Connelly for sharing your story about your son Josh. Your sorrow and heartache are so easily felt as I read about your loss. Hopefully, in sharing your tragedy it can prevent others. Vaccines are victims of their own success, and unfortunately we need families who have suffered first hand from vaccine-preventable-diseases to speak up and share their stories about the times when there was no way to protect children. I wish you well, and thank you once again. I live in Gainesville, FL. I will start out by saying that I am pro vaccine. I had the measles at two weeks of age and I have lifelong neurological damage as a result. I have two children (ages 5 and 7) who are completely up to date on all immunizations. My husband (age 45) never had chickenpox nor had a vaccine. He is an educator in the area. I worry for adults like him that1) did not contract the disease and never offered the vaccine and 2) pregnant teachers. I find people who refuse to vaccinate to be selfish as they only think of themselves and not the others that they can infect (i.e. infants). I think the school systems need to have manditory vaccinations for children to attend school. The fact that many of the children who were not vaccinated in this area on the basis of “religious grounds” immediately were vaccinated when they were told they could not return to the classroom for 3 weeks. Guess those children practice the religion of convenience. Cindy, thanks for sharing your history with measles. I wanted to mention that your husband is most likely able to get the chickenpox vaccine and should talk with his doctor about it. His doctor may recommend titer testing first to make sure he is not immune. My daughter is autistic from a vaccine reaction, and I”ll never let her get another vaccine! She has a religious exemption, but if push came to shove, I’d move to Mexico before I let her get another vaccine and be further damaged. @cia – interesting, seems Mexico is doing as well, if not better than the US in their vaccination rates…. No cia, your daughter is autistic, period. Autism is not a vaccine reaction. You keep telling the lie over and over again. It doesn’t make it anymore true. Do these people read the inserts???? The chances of having an adverse side affect from the vaccine are more common than anything like this ever happening. Some people are just not smart enough to open their eyes to see that these people are not trying to make your children healthy, they are killing them. So while all you vaccinated people have numerous issues thru out your life, I will kick back and not worry about having anything that was vaccine induced. Actually, the inserts are not specific about the rates. They are written by lawyers to cover everything, even things that were probably not caused by the vaccines. Some people are just not smart enough to open their eyes to see that these people are not trying to make your children healthy, they are killing them. Please support this fearmongering statement with some real documentation, not an insert. Post the title, journal and dates of the PubMed indexed paperst that show the varicella vaccine is more dangerous than actually getting chicken pox. Here is an example of one papert that concludes the opposite of your contention: Varicella Prevention in the United States: A Review of Successes and Challenges. And while you are not worrying about having anything that was “vaccine induced” you can explain to us why it is better and safer to have a child suffer for two weeks with dozens of itchy open wounds with a possibility of secondary bacterial infection. For most normal people it is considered cruel and evil to let children suffer, when it can be easily prevented with two doses of varicella vaccine. Great post, Ali, I totally agree! Vaccines are causing one in nine to have asthma, one in 6 to have a learning disorder, one in 10 to have ADHD, one in maybe 50 to have autism (the one in 88 was in those born in 2000), one in 450 to have diabetes. Citation needed, since you have a habit of just making stuff up. viation below or above the mean. Try learning some basic statistics. We have discussed how vaccines don’t cause asthma, autism, learning disabilities, ADHD or diabetes before cia. All you do is lie, eh cia? You just can’t help yourself. @ali – yes, I read the inserts every time I bring my sons in for their routine vaccinations. The chances of an adverse reaction are at least a magnitude lower than the chances of an adverse side-effect from catching the disease. Pretty much everyone I’ve known in my life is fully vaccinated & I have yet to see any of these “issues” you seem to be so concerned about. You might actually want to do some research with reputable organizations, rather than AoA, the NVIC or whale.to, you may actually learn something. Unfortunately for me and my partner we had chickebn pox as children before access to the vaccine. He was diagnosed yesterday with shingles. The poor man is in agony and there is little I can do to help him. Although considered mildly contagious we have contacted all friends and relatives (two of which are undergoing chemo at the moment) to inform. He cannot attend work and as a contractor this is going to seriously impact us financially. I am grateful that the newer generations of my family have had the vaccine to reduce the likelihood of shingles later in life and having to go through this. But you should be aware that among others, studies published in the New England Journal of Medicine and the Pediatric Infectious Disease Journal have shown that shingles is often caused by the varicella vaccine. Either the vaccine or the natural disease can in some cases lead to the later development of shingles. So what? We know that. Now post those actual citations, then post those that show it is caused by the vaccine as often as getting the actual disase. You have a rather poor reputation with veracity, so you do need to provide documentation for your statements. The error in your statement is the word “often”, cia. The unvaccinated are much more likely to get shingles than vaccinated. Zoster has been reported to occur after varicella immunization and can be due to reactivation of either the vaccine-derived or wild-type strain. However, the risk of zoster developing is lower in vaccinated (estimated at 2.6/100,000 vaccine doses) as compared with unvaccinated children (68/100,000 under 20 years of age). The U.K. Joint Committee on Vaccines and Immunity has declined to recommend that the Hep-B and chickenpox vaccines be placed on the recommended schedule, due to the extremely dangerous nature of the vaccines and the lack of need for them. An official French study group on vaccination has recommended that a moratorium be placed on the use of aluminum as an adjuvant in vaccines, due to its tendency to migrate to locations in the body where it damages organs and systems. In India, 47,500 children developed acute flaccid paralysis in 2011 in the wake of an OPV polio vaccination campaign. They became paralyzed shortly after they were vaccinated for polio. Dr. Jacob Puliyel believes that the cases of paralysis, eight times higher than the expected number for AFP, were caused by the polio vaccine, possibly due to the amount of polio virus in the vaccines having been massively increased. Recent links, since you have a reputation of not being truthful. And what do political decisions have to do with the science? Also, India is now polio free. So that was old news. By the way, Europe is still in the throes of a measles epidemic. Not exactly countries that are vanguards of effective vaccine policy. Remember, too, that the UK finally decided to use the MMR a full seventeen years after it was introduced in the USA. So, again, those political decisions based on their different health care policies have nothing to do with the safety and effectiveness of vaccines. @cia – and your citations for all of these are, where exactly? While it is always incredibly sad when a child dies of a disease, shingles will kill FAR more people than chickenpox. Gary Goldman’s PhD is in computer science, and his Medical Veritas journal includes articles by Andrew Wakefield, Harold Buttram, and others who are not reputable medical researchers. The Vaccine paper cited in that undated press release is from 2005, and its sole author is Goldman, who is a computer scientist. Try these citations: Varicella prevention in the United States: a review of successes and challenges and Impact of Varicella Vaccine on Varicella-Zoster Virus Dynamics. When you read them you will realize that it is complicated. It is cruel and sadistic to make children suffer with dozens of open itchy wounds when shingles can be easily prevented with a shingles vaccine designed for older adults. Far more sadistic than allowing our children to experience chickenpox is to prevent them from having a chance at lifetime immunity by experiencing the disease. It is also far more sadistic to inflict upon our elderly the ravages of and potential death from shingles, I would like to see conclusive evidence that a single shingles vaccine can offer lifetime, or, frankly, even 10 years’ worth of immunity to that disease. We certainly haven’t seen that with the varicella vaccine. As you know, we now have the recommendation that the varicella vaccine be administered twice, not just once as originally planned, and I fully expect that recommendation to change to three times in the near future as we have more and more fall-out from the vaccine delaying the onset of, rather than preventing spread of, the disease. We are also seeing age delay for varicella infections: teenagers and young adults are getting chickenpox who in the past would have experienced the disease as a child, which is a far less dangerous period of life for it to occur. The evidence is mounting that shingles cases are not just on the rise, but are increasing at a drastic rate since the varicella vaccine came on the market, and it’s not just the elderly who are being affected. We now have more people in their 20s, 30s, 40s, and 50s who are experiencing the “cruel and sadistic” side effects of the varicella vaccine. You note that Dr. Goldman is not a reputable medical researcher. Surely you cannot make that claim, however, about the entirety of the United Kingdom, which has chosen not to implement the varicella vaccine, instead viewing the U.S. as a guinea pig to see if, in fact, what I’ve mentioned above would come true (i.e., drastic increase in shingles due to lack of “natural” immune boost of having children around who have experienced chickenpox). http://www.hpa.org.uk/webw/HPAweb&HPAwebStandard/HPAweb_C/1221638180451?p=1204186170287 Again, I urge you (and others) to get informed about the dangers of the chickenpox vaccine before erroneously presuming it does more good than harm. I don’t have time to read and give you full reply at the moment. But I will ask you one thing: What must you read and understand before entering the official VAERS database at http://vaers.hhs.gov/data/index? Explain clearly in your own words. In order to get shingles, you must have chicken pox first. People getting shingles now had were infected with the wild virus previously. Thus vaccination to prevent chicken pox is a much better option than not vaccinating. Varicella vaccine is very safe. Reactions are generally mild and include local pain, swelling and redness in 10%-20% of recipients. A low-grade fever has been documented in 10%-15%. A varicella-like rash occurs at the injection site in 3%-5% of vaccinees after the first dose and 1% after a second dose. 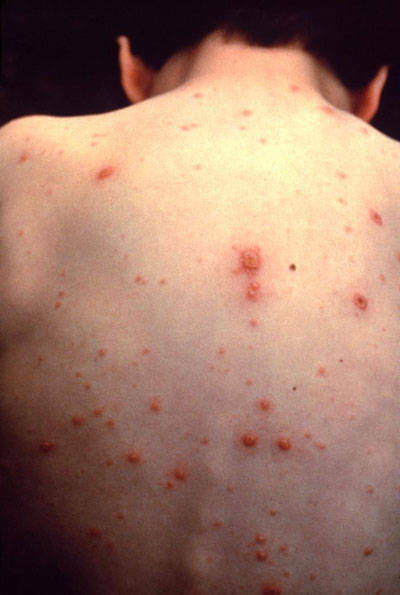 In a similar proportion of vaccinees (5% after the first dose and 1% after a second dose) a small number of generalized varicella-like papules or vesicles will develop. Lesions usually appear within 5 to 26 days after immunization. Most varicella-like rashes that occur within the first 2 weeks after immunization are due to wild-type virus. Health care workers with a post-vaccine rash at the injection site may continue to work if the rash is covered. Those with a varicella-like rash not confined to the injection site should be excluded from work in high-risk patient care areas (e.g., where there are premature infants and immunocompromised patients) until lesions are crusted. Serious adverse events are rare following immunization and, in most cases, data are insufficient to determine a causal association. There is also a shingles vaccine to help combat serious complications from reactivation of the varicella-zoster virus. Kelly, you can get chickenpox from the varicella vaccine. Check out the VAERS database. Anecdotally, the nurse at my son’s school got her 12-year-old son what she thought was a booster only to realize afterward that she had never gotten him the vaccine when he was younger. Guess what? He got the chickenpox. Chickenpox at 5 years old: uncomfortable. Chickenpox at 12 years old: ugh. Kathy, the vaccine can produce a varicella-like rash, but this is different from full-blown chicken pox. Breakthrough cases are caused by the wild virus. You also don’t get lifelong immunity from varicella-zoster. As you mentioned in your previous post, the waning immunity results in the virus reemerging as shingles. VAERS is a passive surveillance method to detect vaccine reactions. It does not indicate causation. You are using the data incorrectly and falsely assigning risk to the vaccine while ignoring the real risk of the disease. Unfortunately Kathy, you are the one that is uninformed about the disease and the vaccine. On one hand you are arguing that because the vaccine is so effective, elderly people are not getting a boost to their immunity and then you argue that the vaccine doesn’t work. Are you so misinformed that you don’t even realize you are contradicting yourself? We have data that shows the vaccine produces immunity that lasts at least 20 years. Also vaccinated individuals with breakthrough cases of varicella have a more mild course of the disease. I provided a link to the Canadian Immunization Guide but you can also find this information in the CDC Pinkbook. These are much better sources of information written by real scientists compared to a press release written by a guy pretending to be a scientist. Kelly, what I am arguing is that immunity conveyed by contracting the disease from the wild virus is far superior to immunity conveyed by the vaccine, both in terms of protecting those who contracted the disease for a longer period of time and in terms of bolstering the immunity of those around them who have done the same. The 20-year time frame you quote is not from the U.S. but from Japan and can’t be assigned to the U.S. because in Japan they only vaccinate approximately 1/5 of the children; hence they still have the immune boost from the other roughly 4/5 who contract the wild virus. If you do a little bit of quick research on the subject, you’ll see that the short-term efficacy of the vaccine in the U.S. is why we implemented a booster shot. In terms of using VAERS for data, I have not made any direct references to the data therein within what I’ve written here. I’ve only challenged others to take a look because, like it or not, it’s what we’ve got, and the CDC isn’t offering anything better to the general public…a disservice unto itself. I prefer peer-reviewed journals. I just tend to start with the lowest common denominator for ease of access for others. I know what you are arguing Kathy, and your argument is wrong. Immunity from the wild virus is not far superior to immunity conveyed by the vaccine. Natural immunity is not lifelong and must be acquired by suffering from a disease that has the potential to kill. Furthermore, when natural immunity wanes, the person is more likely to suffer from shingles and the bout of shingles is likely to be more severe. If you are comfortable with the unpredictable boosting from the wild virus, your argument against known boosting from the vaccine makes no sense. The advantage of the vaccine is we can determine when that exposure needs to occur to maintain maximum protection instead of relying of chance of natural exposure. I did some quick research, Kathy. Here are the PMID numbers for studies that indicate you are just blowing smoke. PMID: 20525895 – shows that the immunity from wild virus is inferior to the immunity from the vaccine virus since the wild virus suppresses the immune response. This ability was lost during attentuation. A little bit of quick research reveals that short-term efficacy was not the reason for the second dose (http://www.cdc.gov/mmwr/preview/mmwrhtml/rr5604a1.htm). The rationale for the second dose of varicella vaccine for children is to further decrease varicella disease and its complications in the United States. Despite the successes of the 1-dose vaccination program in children, vaccine effectiveness of 85% has not been sufficient to prevent varicella outbreaks, which, although less than in the prevaccine era, have continued to occur in highly vaccinated school populations. Breakthrough varicella is contagious. Studies of the immune response after 1 and 2 doses of varicella vaccine demonstrate a greater-than-tenfold boost in GMTs when measured 6 weeks after the second varicella vaccine dose. A higher proportion (>99%) of children achieve an antibody response of >5 gpELISA units after the second dose compared with 76%–85% of children after a single dose of varicella vaccine. The second dose of varicella vaccine is expected to provide improved protection to the 15%–20% of children who do not respond adequately to the first dose. Data from a randomized clinical trial conducted postlicensure indicated that vaccine efficacy after 2 doses of single-antigen varicella vaccine in children (98.3%; CI = 97.3%–99.0%) was significantly higher than that after a single dose (94.4%; CI =92.9%–95.7%). The risk for breakthrough disease was 3.3-fold lower among children who received 2 doses than it was among children who received 1 dose. How this increase in vaccine efficacy (typically higher than observed under field conditions) will translate into vaccine effectiveness under conditions of community use will be an important area of study. Those are just 3 citations above. There are lots more. If you prefer peer-reviewed journals, why not provide those? Oh yeah, because they don’t support your position, so you have to resort to lying to mislead people into thinking you have a valid argument. Considering the people responding to you are better educated on the matter than you are Kathy, you are the lowest common denominator. That’s why Chris asked you if you understood VAERS because you were using the data incorrectly and you don’t seem to understand the purpose of the program. Provide us with the peer-reviewed studies that support your position. You prefer peer-reviewed and so do we. Kathy: If I were you, I would not rely on the VAERS database for accurate information about chicken pox or the varicella vaccine. Why not peruse the CDC Case Surveillance Manual for accurate information? “n many cases, newborns with Congenital Varicella Syndrome may be abnormally small and have a low birth weight due to abnormal growth delays during fetal development (intrauterine growth retardation). In addition, distinctive skin abnormalities are often present. Certain areas of the skin may consist of thickened, overgrown (hypertrophic) scar tissue (cicatrix), and surrounding skin may appear abnormally hardened (indurate), red, and inflamed (erythema). Such cicatrix scarring typically occurs on one or more of the arms and/or legs, which may also be malformed, underdeveloped (hypoplastic), and abnormally shortened (reduction deformities). Affected infants may also exhibit incomplete development (hypoplasia) of certain fingers and/or toes (rudimentary digits). As I presume you know, the Case Surveillance Manual and VAERS are two vastly different tools. Actually, the former isn’t even a tool; it’s just a summary document, not something from which data can be extracted and assessed. Therein lies the problem. We don’t have sufficient (or in some cases, ANY) strong data…not enough to determine the numbers of varicella cases caused by the varicella vaccine versus wild strain, not enough to determine the full extent of the increase in herpes zoster that is caused by the varicella vaccine, not enough to determine just how many repeats of the varicella vaccine are needed to get someone to the end of a typical lifespan without contracting the disease (though I’m doubtful that’s likely to occur very often), not enough to determine just how much damage we’re doing by tampering with the typical pattern of this disease. Again, I’m averse to being viewed by a good part of the world as a guinea pig nation in this experiment that’s called universal varicella vaccination. I look forward to your reply with evidence of the safety and long-term efficacy of the shingles vaccine. So Kathy, you admit that you know VAERS data doesn’t provide evidence for causality, yet you are advising us to look at VAERS data because it indicates the vaccine is more dangerous than the disease. Why should we take anything you say seriously when you just admitted to being dishonest? I did not mention your intellect. I was in hurry and asked you to explain what you had to read and understand before entering the VAERS database through the official website. That is because NVIC lets you skip that part. I am very familiar with the disclaimer, as I am also very familiar with the lack of science and rigor with self-selected surveys. I want to make sure you understand its limitations. Now explain what the dangers are to children from the varicella vaccine, and what the dangers are to the elderly from the shingles vaccine. You need to keep those issues separate. Please provide the title, journal and dates of the PubMed indexed papers to support your statements. Since only a percentage of people who had chicken pox young get shingles, please tell us give us the verifiable scientific documentation for that statistic from a PubMed indexed paper that includes real epidemiologist as an author, and not a computer scientist who presently runs a home school organization. as an infant…and I don’t believe my son’s pediatrician reported it either. (I can assure you that I am older and wiser now. )…would not “qualify” to be reported to the Vaccine Adverse Event Reporting System”…unless your son suffered an adverse event that was attributed to double-dosing of a combination vaccine. Kathy…you seem to have a distrust of reliable studies conducted in the United States about the safety and efficacy of the Zoster vaccine, that is recommended by the CDC for older people who had actual chicken pox diseases in early childhood. How about this report from the European Medicines Agency of large double-blinded studies, that yielded similar results about the dramatic decrease in shingles and post herpatic neuralgias following Zoster vaccination, as the Kaiser Permanente studies that I linked to, in a prior post? I simply don’t know why you continually rely on the VAERS database which you yourself acknowledge is prone to contamination by bogus reports and is a passive reporting system, when there are reliable double-blinded, placebo-controlled studies conducted in the USA and in Europe that verify the safety and efficacy of the varicella and Zoster vaccines. I suggest to you Kathy, that your have a pre-conceived bias to the vaccines and will use any “resource” indiscriminately to back up your fallacious arguments against these vaccines. Time to fold your tent now Kathy…your bogus studies and your personal anecdotes and”opinions” don’t count here and have been thoroughly debunked by me and other posters, who really know immunology and disease processes…backed up by multiple reliable post-licensing studies. The information sources you’ve referenced only provide data having to do with the effects of one or the other of the two vaccines in question, and not to the llong-term effects and interrelationship between the varicella vaccine and shingles. You also haven’t referenced any modeling studies that assess what is likely to happen in the long term. As I mentioned in another post, that’s not that significant of an error on your part as we have almost no data to support the long-term safety and efficacy of either vaccine. Besides, what information we do have in that direction doesn’t support your case. As to your last sentence, if I thought it were true that only people with your opinion were allowed to post here, I most certainly wouldn’t have bothered. Thankfully, you’re not the moderator. Except Kathy, shingles existed before the varicella vaccine. The vaccine has not caused shingles. Furthermore, you haven’t even established that the use of the vaccine has caused the increase of shingles. Shingles has always been a nasty disease, so a vaccine to help prevent an outbreak is a good thing no matter what you think. Your argument also falls apart because by allowing children to get chicken pox, you are setting them up to get shingles down the road. How selfish are you to expect that children should suffer on the low chance that their suffering may prevent yours? We have safety studies of more than 20 years for varicella vaccine. How long term do you want? And considering the shingles vaccine is the same virus as the varicella vaccine, except at a higher concentration and is used to combat the wild virus already dormant in the person, what makes you think that the shingles vaccine is going to be unsafe? The information we do have does support the safety and efficiency of this vaccine. You admitted it yourself when you contradicted your own argument. You have admitted to outright lying to try to make your point. I’m glad you posted here because you demonstrate the dishonest tactics of anti-vaxers. Except Kathy, shingles existed before the varicella vaccine. The vaccine has not caused shingles. Like what the infection-promoting Cris would insist, give the Pubmed paper, the title and the date that states the varicella vaccine does not cause shingles. What a tool. Kathy, would you care to provide some details about the double-dosing vaccine that your son received…and what serious adverse event he experienced, due to extra dose of vaccine he received? Likely I would have minus your snide comments at the end of your prior post. I will though urge you to read this article about VAERS from an actual epidemiologist: VAERS as “evidence” of vaccine harm. J Intern Med. 2012 May;271(5):510-20. doi: 10.1111/j.1365-2796.2011.02474.x. Epub 2011 Nov 22. Safety of zoster vaccine in adults from a large managed-care cohort: a Vaccine Safety Datalink study. Vaccine. 2011 Sep 2;29(38):6592-7. Epub 2011 Jul 16. Risk of rheumatoid arthritis following vaccination with tetanus, influenza and hepatitis B vaccines among persons 15-59 years of age. Pediatrics. 2011 May;127 Suppl 1:S54-64. Epub 2011 Apr 18. Active surveillance for adverse events: the experience of the Vaccine Safety Datalink project. Pediatrics. 2010 Aug;126(2):263-9. Epub 2010 Jul 19. Lack of association between acellular pertussis vaccine and seizures in early childhood. Now I await postings of the scientific research that shows it is too much to ask an older person to get a couple of shingle vaccines over a period of a decade. Do you also think that getting a tetanus booster every ten years is too onerous? Kathy…You have been told repeatedly that your “beliefs”, your “anecdotes” and your knowledge base about the nature of herpes-type infections is spectacularly wrong. You have been provided with multiple post licensing studies of both the childhood varicella vaccine and the adult zoster vaccine, yet you cling to ignorance based on your “beliefs” and your “anecdotes”. We can only conclude that nothing will disabuse you of your fallacies. And Kathy, I knew all along that you would not provide any details concerning your assertion that your infant child was given a repeat dose of a combination vaccine which resulted in a serious adverse reaction. That “story” was a figment of your imagination. Are you saying the varicella vaccine will protect the unvaccinated from the vaccine-induced pox of about 50 lesions and the risk of shingles associated with the virus that you have inoculated in their system? Yeah Pubmed Cris, where’s your evidence? Give me the title and the date. You see the disconnection and your utter ignorance lilady? Just ignore disease-phobic, child-hating, health care professional wannabe troll. What nursing job did you have, in what hospital, Thingy? https://www.facebook.com/groups/701669623184647/ There is a group on Facebook called Chicken Pox Natural Immunity Network. The group educates others on natural Chicken Pox exposure, risks of the CP vaccine, risks of natural exposure. For those who seek Chicken Pox there is more opportunity as there are outbreaks posted all the time. If your child contracts CP naturally and gets a blood test (titers) they can avoid the vaccine and future quarantine if the test shows immunity. So, why the hell are you resurrecting a 2+ year old threat, necromancer. And why in the world would you advocate letting children suffer through a disease such as chickenpox? @novalox – sounds like or is similar to the group that got in trouble a few years back trying to send infected lollipops through the mail. Wouldn’t it be a federal offense to knowingly mail an infectious disease via the postal service without the proper permits? Thanks, Pixie, it’s a great site, I just checked it out. Those who want their kids to have permanent immunity before they’re grown up need sites like this. Or to put it another way, Lawrence: “could be vaccinated and not have a chance of suffering two weeks with dozens of painful itchy open sores called pox, with a possibility of secondary infection.” Only a sadist would want kids to suffer like that. Cat, there is not “permanent immunity” to chicken pox. The virus never goes away, it lingers on with a chance to re-activate to very painful shingles. Please don’t lie. Chris :Or to put it another way, Lawrence: “could be vaccinated and not have a chance of suffering two weeks with dozens of painful itchy open sores called pox, with a possibility of secondary infection.” Only a sadist would want kids to suffer like that. And the host’s immune tolerance of it fades as well, so the virus naturally reactivates inn later life causing nasty complications such as shingles. Pixie PoxfairyChicken :https://www.facebook.com/groups/701669623184647/ There is a group on Facebook called Chicken Pox Natural Immunity Network. The group educates others on natural Chicken Pox exposure, risks of the CP vaccine, risks of natural exposure. For those who seek Chicken Pox there is more opportunity as there are outbreaks posted all the time. If your child contracts CP naturally and gets a blood test (titers) they can avoid the vaccine and future quarantine if the test shows immunity. I looked at this closed “group”. What a sad indictment of society today that groups like yours exist (I mean you Pixie) where you encourage people to infect their kids with a preventable disease, when the evidence is crystal clear that the potential harm from vaccination is vastly outweighed by the actual and real harms caused by the natural infection.